The arrival of system and sound engineer Laurent Delenclos at French HARMAN Professional distributor SCV Audio eight months ago has not only boosted the company’s technical support, but provided added reassurance to the growing network of JBL VTX users. Although Delenclos is supporting all the represented HARMAN Professional brands, his primary focus has been on spreading the word about VTX, JBL’s new system, via demos and at the SCV Audio facility outside Paris. 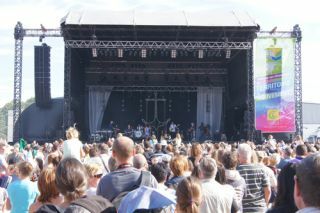 Following the VTX system’s French debut in September 2012 at the summer festival, Foire en Scène in Chalons en Champagne, three companies—Pan Pot, Echo Animation and Audio Scène—have made investments in the platform. As an existing JBL VERTEC user, Audio Scène (based in north-central France) was the first to commit, consolidating its rental fleet with 12 VTX V25, six G28 subs and four Crown VRack 2 complete touring amplifier racks.